A webcam has proved to be an accessory that you can live without, although those who are involved in long distance relationships might beg to differ. After all, there is nothing quite like seeing your beloved in the flesh despite being separated by thousands of miles, with a phone call coming in second where keeping in touch is concerned. Logitech does not only make computer mice, you know, as the Swiss company is also involved in a bunch of other peripherals where among them include keyboards and webcams, which we will look at the latter in greater detail today with the business-class Logitech HD webcam B525. The relaunch of the business-class Logitech HD webcam B525 happened in order for the B525 to take advantage of an ever-changing workspace  regardless of whether it is at your office, at your favorite coffee haunt, the airport terminal, or even in the comfort of your home, where it delivers seamless video calls without missing a beat. 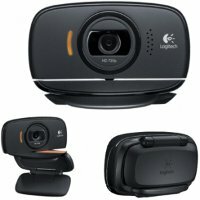 Among the features in the Logitech HD webcam B525 that you will read of, they are available after the jump. The B525 will come in a simple fold-and-go design that allows you to pack it up in a jiffy, perfect for those who are always on the go. Not only that, the inclusion of a 360-degree swivel rotation lets you make a call and record in just about any angle – perfect for those moments when you are so bushed that all you want to do is carry out your conversation right on the comfort of your fluffy bed. Alternatively, this allows you to turn the camera away for added privacy, now how about that? There is an integrated autofocus capability to make sure that you remain at the forefront and center of the webcam whenever you are involved in a video call, and with Logitech’s RightLight 2 Technology, your eyes will experience sharp video quality, never mind that the lighting around you is less than satisfactory. As for the built-in mic, it was specially formulated to minimize background noise. Featuring both Microsoft Lync and Skype certification, the Logitech HD webcam B525 is already in the market if you’re interested in introducing video conference calls to your office.